BY PATRICK WATSON : In June, the US ran a $32.6 billion “trade in goods” deficit with China. That’s the difference between our imports from China ($42.3 billion) and our exports to China ($9.7 billion), according to the US Census Bureau. That sounds terrible, but it’s really not if you look at the big picture. The Trump administration doesn’t like trade deficits, so they must be reduced or eliminated. To do that, we need Chinese consumers to buy more “Made in the USA” products. Problem is, China has little need for US-manufactured products beyond the agricultural goods it already buys. They would buy certain things we refuse to sell them, like defense technology. What else can we send? Here’s an idea President Trump should consider. Everything about China is big—including its health problems. About 100 million Chinese have some form of chronic hepatitis, according to the World Health Organization. That’s 1 in 13 people. Hepatitis can lead to liver cirrhosis and liver cancer, so this is a serious problem. Treating it requires serum albumin, a substance found in human blood plasma. As the Financial Times reported last week, Chinese patients consumed 300 metric tons of serum albumin in 2016, approximately half of the global total. Now, while the necessary supply could be provided by the Chinese population, many of them are afraid to donate blood. 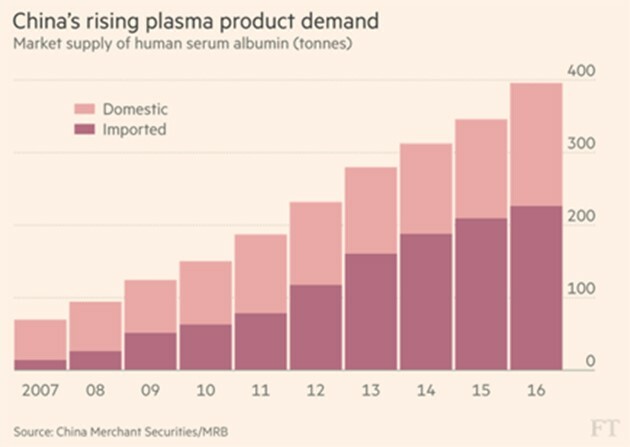 As a result, China has to import about 60% of its serum albumin—and the ever-rising demand has driven up prices. Interestingly, even though CSL is an Australian company and Grifols is from Spain, all three collect most of their plasma in the US. That suggests we have some natural advantage. Total US blood plasma collection was 31,000 metric tons last year, compared to only 7,000 metric tons collected in China—even though China has four times as many people. Clearly, Americans have an edge in this business. We could amplify it by ramping up blood plasma collection to keep pace with rising Chinese demand. This would help reduce the trade deficit and might have other benefits too. To give blood, you must be in generally good health. That may incentivize donors (who are often paid for giving blood) to avoid unhealthy lifestyle choices, which in turn could result in lower healthcare expenditures as a side benefit. Another advantage: Blood plasma offers high value for its volume and weight. One refrigerated container might be worth more than an entire shipload of grain, for instance. We’d be able to boost exports with minimal extra carbon emissions. In this case, one obvious risk is competition. Americans aren’t the only ones with blood to sell, so other countries could underbid the US. In addition, researchers in China and elsewhere are working on an artificially produced serum albumin. One Chinese project using rice seeds has proven safe and effective in initial trials. These are indeed risks, but I think they’re minimal for now. The US can maintain its edge as long as we maintain high quality. President Trump loves to make deals. I think this is a natural one he could negotiate with President Xi. The Chinese can get all the made-in-America blood plasma they need, saving many lives. US healthcare spending will fall. The US-China trade deficit will shrink. See, everybody wins. What’s not to like? Regular readers know I’m very concerned about the Trump administration setting off an economically destructive trade war. I hope it doesn’t happen, but I think investors should prepare for it. International trade doesn’t have to create winners and losers. Voluntary exchange is good for everyone.